In an update to its universal iOS app on Monday, Facebook joined the voice messaging feature taken from Facebook Messenger with a new in-app video recording asset to give users even more ways to keep in touch with friends. 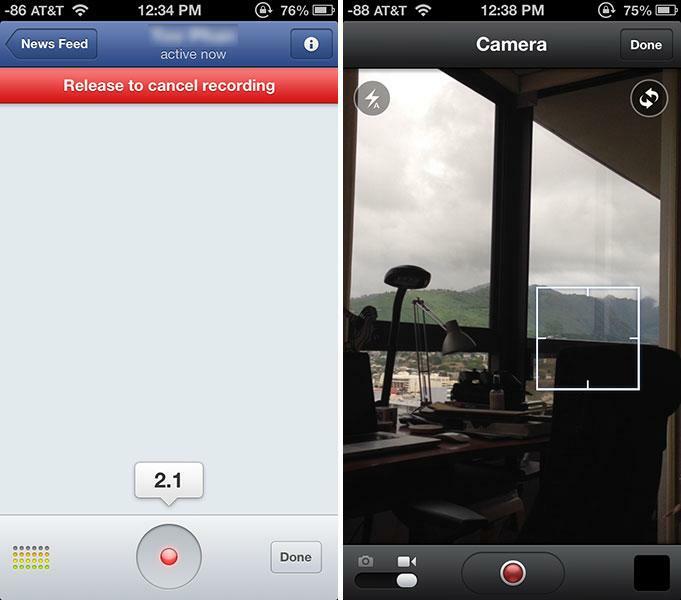 Facebook's new in-app voice messaging (left) and video recording (right) features. The latest version of Facebook for iOS is the third app update in less than a month for the ubiquitous social networking site, which has been aggressively updating its feature set as competition from other services like Twitter and Google heat up. Earlier in January, Facebook Messenger introduced voice capabilities that gave users the option to send one-minute long voice messages instead of normal texts. At the same time, the company rolled out its own proprietary voice over IP service as a trial in Canada. The company activated the VoIP solution for U.S. users about two weeks later. The new in-app voice messaging feature works in much the same way as the Messenger app. Users simply click on the "+" button in the next to the messages text box, press the record button and release to send. While video recording is not a messaging feature, users can now upload short clips directly to their timeline without exiting the app. The feature can be accessed in the "Photo" menu at the top of the News Feed. Share your moments with voice messages and video recordings right in the app. Share and connect with your favorite places using the improved Nearby tab. The universal Facebook for iOS app weighs in at 20.6MB and can be downloaded for free from the App Store.